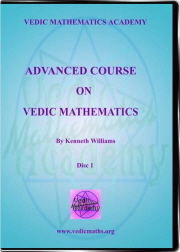 This issue's article is by Kenneth Williams and is about Sri Bharati Krisna Tirthaji's book "Vedic Mathematics". The 9-week course is for people who have some teaching experience who would like to become certified Vedic Mathematics teachers. It is conducted entirely online: more details are available at the above link. There is a small application fee of $15 and an opportunity to offer a donation at the end of the course. As the course is always over-subscribed you are advised to apply as soon as possible. In February I was invited to speak at the local chapter of the View Club, a ladies charity which helps underprivileged children with assistance for their education by supporting the parents with the cost of books , uniforms etc. Most of the members are in their 60's and 70's but there are also ladies in their 80's and 90's. I spoke about the difficulties that children experience in Primary mathematics and the fact that many parents and grandparents do not understand the methods by which the children are asked to calculate. We discussed the changes in learning mathematics from the 'old days' till now. These grandmothers would like to help their children but find it too challenging. I outlined the way that I teach the four operations, with the children calculating mentally in all cases. There was one lady whose granddaughter is a student of mine and she vouched for the fact that her granddaughter (aged 12) was completely innumerate before coming to me. After 6 lessons she is able to perform all calculations with ease and most importantly her confidence is bringing her so much joy. The following week I heard that the ladies were very excited about the prospect of helping their grandchildren so I have suggested that we have a class for them to all learn Pebble maths with a view to becoming tutors. I thought that it seems unfair to leave the men out of the picture and am in the process of communicating with U3A which is the University of the Third Age, a facility for the retirees, to see if they will advertise my course. I feel that it would be wonderful for children to be tutored by their grandparents. There are so many elderly people who are left behind in the slipstream as our society rushes ahead with the technologies that are incomprehensible to so many senior citizens. Some of these people would feel such a sense of achievement by helping the young ones to learn. It is also a fact that by working in the Vedic way , stimulating the brain , we are keeping the signs of mental aging at bay . I am sure that these seniors would see the benefits in their own lives to a tremendous degree. Mrs. Sujaritha Raghavan in Chennai, India is now teaching Vedic Mathematics in a school as part of the curriculum. If you are teaching VM as part of a school curriculum we would like to hear from you. Sri Bharati Krsna Tirthaji's book "Vedic Mathematics" was first published in 1965, by Banaras Hindu University. It did not attract much interest at the time but was noticed by Mr S. M. Jaiswal who brought a copy to London shortly after publication. The book was then studied by members of the School of Economic Science who recognised its significance and importance. This was a time when calculations were carried out with tables of logarithms, slide rules and large mechanical devices in which one set certain levers and then turned a handle forwards or backwards. This gradually changed of course and in the early years that Bharati Krsna's book was being studied electronic calculating devices were being developed and used. The advent of these devices led to the view among many educationists that calculation would no longer be required in mathematics education, no doubt based on their own experiences of tedium when at school. So this was the main argument used in dismissing Bharati Krisna's book and work. When studying for my Astronomy degree at University College London in 1980 I went to see the head of mathematics there who simply flicked through the book and advised me not to waste my time on it. His attitude was so dismissive that I knew there was no point in trying to persuade him. This reaction was repeated, with variations, with other University mathematicians I sought advice from. My own reaction from studying the book was one of amazement and awe. I really got the impression that here was someone who knew mathematics - really knew it from the most fundamental principles. The system he exposed was beautiful, extensive and above all, coherent. Modern mathematicians specialise in one small area and develop it; they never look for the full picture. The point of the present article is to draw attention to the fact that this book still contains many gems, waiting to be discovered and developed. Bharati Krsna wrote sixteen other books which were lost and it seems unlikely now that they will ever be recovered, so this one book is almost all we have. I say 'almost' because (a) we have the book "Vedic Metaphysics" which is a compilation of lectures given by Bharati Krsna on his tour of the USA, and (b) to the diary notes that are available. Before suggesting possible locations of some of those gems, and giving some advice about how to penetrate further let me give an example from my own experience. Like so many people I was fascinated by the so-called "Pythagorean triples". Thousands of articles have probably been written on their seemingly endless and remarkable properties. I read Bharati Krsna's Chapter 31 on "Sum and Difference of Squares" in which he generates Pythagorean triples and which has a curious construction. Personally, I like mathematics to have applications: though many people study maths for the joy of it, I prefer to see some use of mathematical results. And I could see no application for these Pythagorean triples, until it occurred to me that what was needed was a way of combining the triples together. This led to a triple arithmetic that not only had a huge number of applications which unified many areas of mathematics, but also exhibited the Vedic sutras naturally as it developed. One insight came from Chapter 31: why had Bharati Krsna chosen those particular triples for his illustrations? He chose triples 35,612,613 and 57,1624,1625 and 141,9940,9941 when he could have chosen examples with far smaller numbers. What was special, if anything, about those triples? It turns out that the first two of the three triples quoted above are complementary, and the third is self-reciprocating. I cannot explain the details here but note that 2/35 = 0.057 and 2/57 = 0.035 to 3 decimal places. And the smallest angles in those two triangles are 0.057 and 0.035 radians. We don't know if Bharati Krsna deliberately or inadvertently left those clues there but there are many other instances in the book that may be pointers for those who wish to seek further applications of Vedic Maths. For example, towards the end of Chapter 2 Bharati Krsna shows how to multiply a number by a number consisting entirely of nines, saying it "is not frequently in requisition elsewhere but is often required in mathematical astronomy etc." And he mentions something similar on the next page. This is unexpected and intriguing. What is this application he refers to? An interesting comment appears at the end of Chapter 32. Having shown how to use the binomial theorem for finding the cube and fourth power of numbers he says: "The "binomial theorem" is thus capable of practical application and - in its more comprehensive Vedic form has thus been utilised, to splendid purpose, in the Vedic Sutras. And a huge lot of Calculus work both differential and integral has been and can be facilitated thereby." What are these Vedic methods of using the binomial theorem to facilitate calculus work? At the end of Chapter 37 Bharati Krsna gives his fifth Vedic proof of Pythagoras' Theorem. He shows how to find the distance between two points (a,0) ands (0,b) using what appears to be Pythagoras' Theorem, explaining that "the Vedic Sutras establish their Conics and Coordinate Geometry and even their Calculus, at a very early stage, on the basis of first principles and not from Pythagoras' Theorem..." What is the answer to this seeming paradox? The hymn to the Lord Sri Krsna in chapter 40 gives the value of pi to 32 figures, "with a self-contained master-key for extending the evaluation to any number of decimal places". To date no-one has been able to explain this. Chapter 40 also gives two lists of topics where the Vedic Sutras can be very helpful. The content of these lists and the wording is extremely curious and certainly much is to be discovered here too. Many questions are still to be resolved too in relation to the Sutras. I am convinced that there is a lot more to discover from a study of Bharati Krsna's book and urge those with an interest in original research to give this book a close study. But to succeed with this research needs patience, persistence, and an open and quiet mind uncluttered by traditional learning.